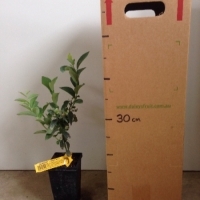 Daleys Fruit Tree has Plants for Sale to Tacking Point and can Mail Order them to you door. Click to Find out how much Freight Will Cost. Often called Rabbiteyes this is one of the hardiest of all the blueberries. Berries often form like grapes in thick clusters. This variety is often in the shops due to it's larger size and bigger harvest. It ripens in the middle or end of the blueberry harvesting season. It is self fertile but you can increase it's yield by planting it near other varieties. This variety is very well suited for the home orchard. Noted because the fruit has a powdery blush and is medium in size. 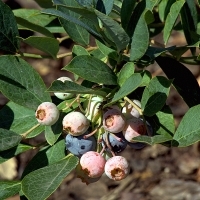 It is one of the toughest blueberry varieties with a harvest later in the season. A bigger harvest can be achieved by mixing with other rabbiteyes such as the tifblue or others will suit. A great selection for QLD and northern NSW as they don't need many chill hours for the fruit to set. Often the white flowers have a flush of pink. Grows well in pots and has thick enough foliage to be used as a hedge in summer but lets the light through in winter.